Looking for a creative twist to put on your Thanksgiving turkey this year? Why not cryosear and cryorender it? The chefs of the experimental kitchen (read: nefarious secret lab) at Intellectual Ventures developed this technique to solve the age-old cuilinary quandary: how do you cook the fatty skin on a duck breast so that it's nice and crispy, without overcooking the meat itself? 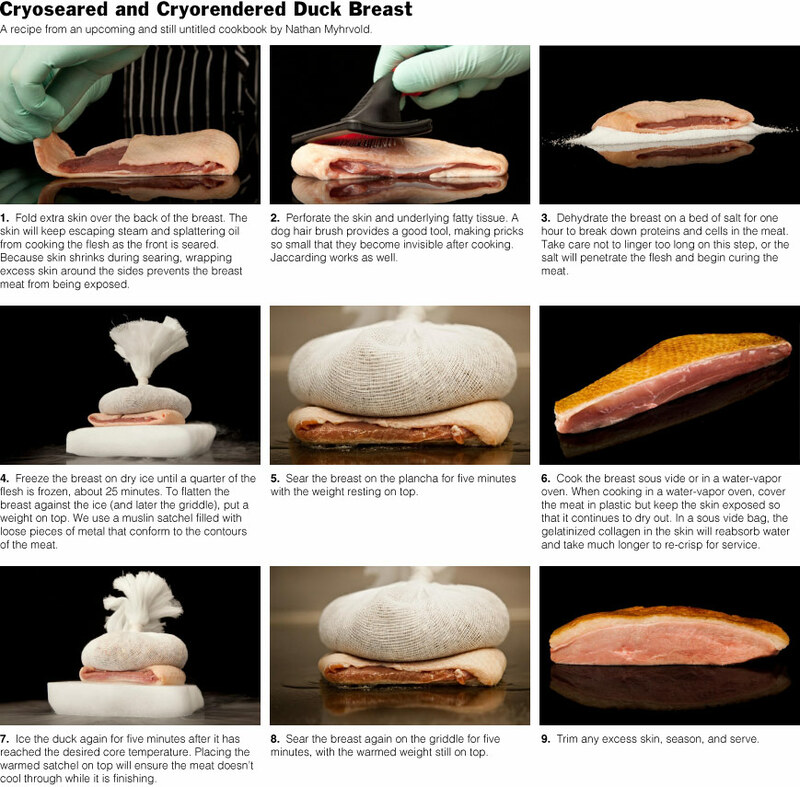 The recipe is more Mythbusters than Julia Child: it involves pricking the duck's skin with a (hopefully unused) stainless steel dog hair brush, dehydrating the skin-enshrouded duck breast on a bed of salt, and pressing it between a satchel of metal pieces and a slab of dry ice. The idea is simple: the tiny holes in the skin help the fat cook faster, and the ice treatment prevents the meat from over cooking while the skin begins to bubble and crisp. Just don't walk into your local Bed, Bath, and Beyond and ask for a block of dry ice or a "muslin satchel filled with loose pieces of metal," which is what the recipe calls for. Oh, and I forgot to mention—to get the duck meat to the right core temperature, you'll have to vacuum-seal it in plastic and cook it in a strictly temperature-controlled warm water bath. This is a method known as sous vide: it's French for "under vacuum," and joined the more commonly found phrases au jus, a gratin, and a la mode in the 1970s. Physics has long been an essential part of cooking. 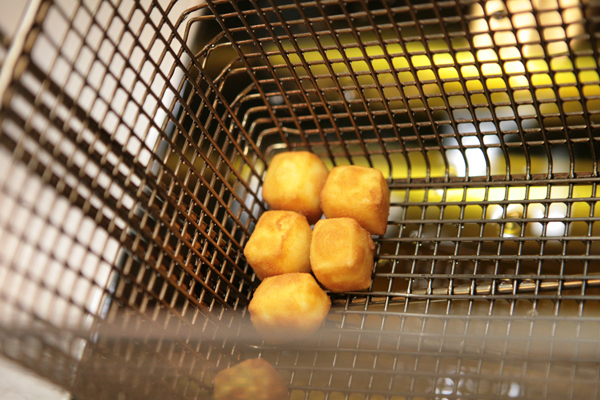 Your oven is a hotbed of convection. We zap our food with microwaves to heat it. We "deep fry" turkeys with UV light. Wait, really? Yes, really. Why do you care? If you're an avant-garde chef trying to push the limits of culinary creativity, you might join renowned chef Jean-Georges Vongerichten in gushing, "There are no new fish coming out of the ocean and all the food groups still remain the same. So to provide innovative tastes and culinary experiences, chefs search for new techniques and technologies—like the PolyScience Immersion Circulator, which enables us to cook with an accuracy and precision never before possible." The secret formula for the time it takes to perfectly soft-boil an egg. Who ever said that physics wasn't useful? The PolyScience Immersion Circulator looks like it belongs in a niche tech catalog for low-temperature physicists (between the strain-gauge section and the fold-out advertisement for the latest cryostat, I imagine), keeps your water bath stable to within .09 degrees Fahrenheit of the desired temperature, and will set you back $1,069.00, something you might more readily afford if you had extra grant money lying around. If you do decide to shell out for the gadget, why not help test some of the sous vide recipes that Douglas Baldwin, a Ph.D. student in applied maths at the University of Colorado, is trying to develop? On the other hand, if you're trying to deep-fry mayonnaise, you might try something off the processed-food shelf: xanthan gum. The New York Times describes it quite evocatively as "a slime fermented by the bacteria Xanthomonas campestris and then dried." Look for it on the ingredients label of your salad dressing. Like cornstarch, it thickens liquids into a gel, allowing chefs at Lower East Side restaurant WD-50 to deep fry mayonnaise and synthesize foie gras you can tie into a knot, satisfying appetites for innovation and gourmet food all at once. Well, there you go. Sure answered all my questions. Thanks.